On a pretty busy Sunday last week, my son and I hurried downtown to see an adaptation of some of the Jeeves books by P.G. Wodehouse. 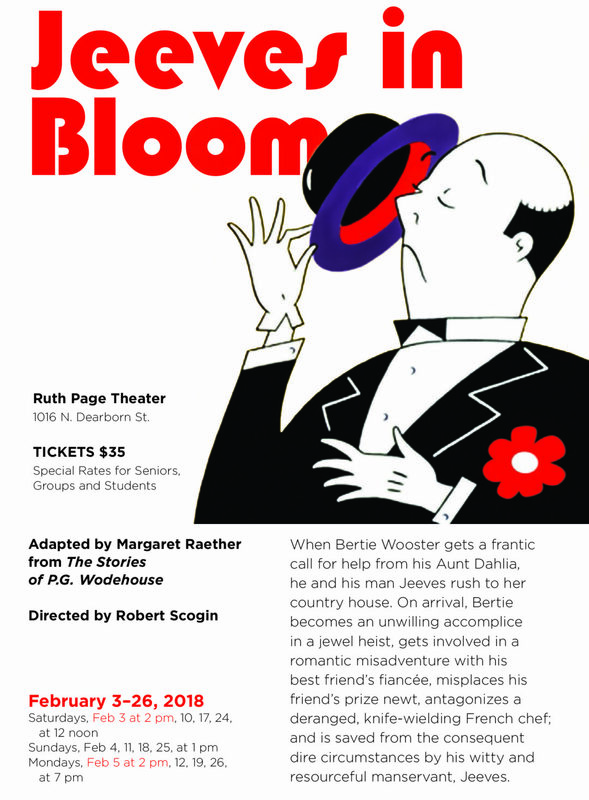 The play, Jeeves In Bloom, has still got a few more shows left (it closes February 26) at the Ruth Page Center for the Arts on Dearborn, so I wanted to make sure to get my review in so that some of you fine people that read my blog might actually go see it. If you are unfamiliar with PG Wodehouse or Bertie Wooster and Jeeves, you are in for a treat. Bertie is an English fop and bon vivant, a hapless fool with too much money in his bank account. Jeeves is his omniscient manservant, who manages to extract Bertie (and often his hapless friends) from their terrible situations and their even more terrible ideas. Sean O'Casey once tried to insult Wodehouse by calling him English Literature's Performing Flea. Wodehouse took that as a positive, and in fact published some of his letters under the title "Performing Flea." And of course that has endearing meaning for me. Even if you haven't read the books, or are familiar with the characters, this play is a great introduction to them. The play is produced by ShawChicago, an Equity theatre company about to enter its 25th season. Its mission is to present the plays of George Bernard Shaw and his contemporaries as concert readings. For those of you unfamiliar with the idea, this means that the actors do their work in front of music stands. There's no set, no props, minimal costumes. It's the actor, the playwright, and the audience. And it works! The actors are great all around, and bring life to their characters. Jeeves has a bit of a stark and starchy stentorian air, as played by Doug MacKechnie, and Christian Gray gets Bertie's haplessness perfectly. I especially loved Matt Penn's Anatole, the mad French chef who is a temperamental artist. Other performances I especially liked included Allison Cook as the overly flighty in love with love Madeline Basset, and Gary Alexander's newt loving shy boy Augustus Fink-Nottle. But really, everybody was great in the show!